Michelangelo's The Creation of Adam. Edgar Degas's The Ballet Class. Jan Vermeer's Girl With a Pearl Earring. You know and love these masterpieces of Western art...but you've never seen them quite like this! 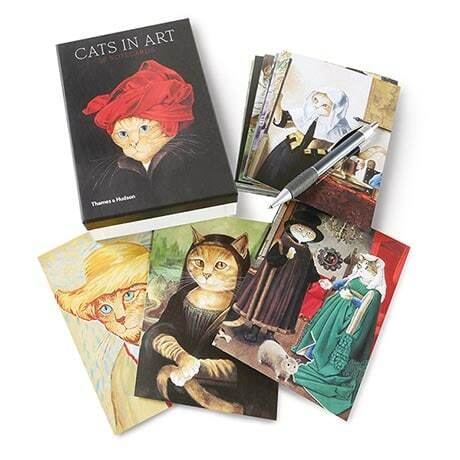 Artist Susan Herbert has cheekily reimagined twenty iconic paintings with feline subjects, all drawn from her book Cats Galore: A Compendium of Cultured Cats, and all guaranteed to draw a giggle from the cat-lover in your life! Whimsical and wonderful, this boxed set of blank 4½"x6¼" note cards includes one each of twenty designs, plus coordinating dove-gray envelopes.